I am going to take the opportunity to flash a little math, mostly with the idea that you will be able to look up some of this stuff if you ever do want it. So, pencils down, no test later. Remember the name, because that is the generic heading of the area of number theory in which Fibonacci numbers and Golden Ratios (aka Golden Means) appears. This will let you find the books with all the illustrations that ASCII won’t support. If you want to stop now, trust me. Get a book with pictures that talks about Continued Fractions, Golden Ratios, and Fibonacci numbers. Then convert the illustrations to knitting charts. Otherwise, “Ave Caesar, morituri te salutant” [salutem? Someone corrected this, but I can’t remember what it was supposed to be.] Here we go with some more information that can help you do your own. the same ratio (often called “g” for “golden”). NON-IMPORTANCE ALERT: Number theorists wax romantic over g because it is the only irrational number with a continued fraction expansion that only uses the digit “1” over and over. But number theorists are modern practitioners of the Greek neat-numbers religion, so what do you expect? This is why some buildings look “nice”, why 3 x 5 cards are popular, and why flags are the particular shape that they are (usually). For example, 5/3 = 1.67, pretty close, so the human brain finds that rectangle pleasing. Hence, 3 x 5 cards. A4 paper is closer to Golden than US letter size, by the way. You can check with a good picture of a Greek temple and a ruler: the width of the front of the temple divided by the height will almost always come out to 1.62. (Did you think I was kidding about the religion part?) Also buildings by Thomas Jefferson, modern national flags, and US “pocket” paperback books. For a further look into the weird (which actually leads to cool pictures, you should really get a book and look), we move to seashells and Golden Rectangles. If you have an 8 x 5 Golden Rectangle, you can divide it into two parts. where you add up the last two numbers to get the next one in the list. In this case, 8 + 13 = 21, so 21 is the next one in the list. the rusty part. Something to do with Fibonacci numbers, anyway.) Also pine cones, I think. There is the Golden Ratio again. As you go farther and farther along the series, the ratios bounce back and forth from one side of g to the other, but always getting closer. For practical, everyday purposes, by the time you get to 3 & 5, or 5 & 8, you get the Golden Ratio from then on! The messy part at the beginning is why Avital didn’t like the first parts of the Fibonacci sweater she mentioned — it hadn’t gotten very close to “golden” yet. And that is why it looks nice from the 3 or the 5 part onward. If you take two Fibonacci numbers in a row and divide sweaters into parts based on those numbers, then human eye will like it. 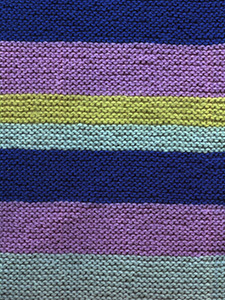 One year at Stitches I took a workshop with Gloria Tracy on applying color theory using up your stash. She had us do some exercises (a la sandbox style) with setting up color sequences of yarns wrapped around cardboard, using variations of Fib sequences, such as a bell curve (8,5,3,2,1,2,3,5,8), doubling (10,6,4,2…) and various other ways to play. I’d love to see a whole magazine series on how to apply some of these magic formulae to designing.